Summer and beer are two of those inseparable duos, like Bonnie and Clyde or Snoopy and Charlie Brown. This summer in Berlin has been exceptionally hot, so there is no excuse not to grab a beer as you stroll around the city. And most importantly: drinking alcohol on the streets is not illegal in Germany, so there is no reason to hide your bottle in a brown paper bag! And I’m sure you’d like to grab some typical Berlin cuisine to go with that beer, right? In fact, we were super happy when our partner Beck’s invited us to collaborate this summer by giving you some ideas on how to battle that food craving. For this reason, we have selected three of Berlin’s most distinctive snacks to be found on almost every corner of this fair city. Check them out! 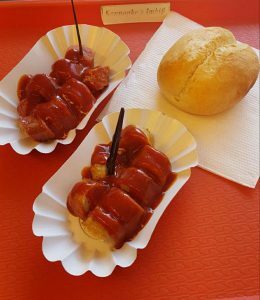 Berlin’s iconic street food classic consists of a fried sausage (“Wurst”) sliced up and covered in a mixture of tomato sauce and a mild curry powder. It is served with French fries (“Pommes”) and/or a white bread roll (“Brötchen”, or if you really want to sound local: “Schrippe”). Ask for your Curry Wurst with or without skin (“mit Darm” or “ohne Darm”) and impress the vendor with your German language skills! Just like the Curry Wurst, the Döner Kebab is also said to have been invented in the German capital. A late-night staple and post-party “hunger killer”, Berlin’s famous Döner is prepared with sliced meat and salad, stuffed inside a delicious pocket of Turkish white bread and often wrapped in foil… Ready to take away! 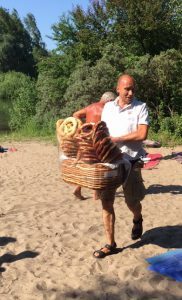 Even though pretzels are not typically from Berlin (they traditionally hail from the South of Germany), this doughy delight shaped into a twisted knot and baked in the oven is the quintessential German nibble. We dare say that this is the ultimate beer snack! As the “little brother” to your big beer, you can enjoy the unique taste of a German pretzel (which is apparently thanks to the baking effect on the lye treatment, which gives the pretzel its traditional skin) at your local “Imbiss” (typical German fast-food stand or trailer), or in one of Berlin’s countless beer gardens. Of course there are many other traditional snacks and dishes you should try while in Berlin. 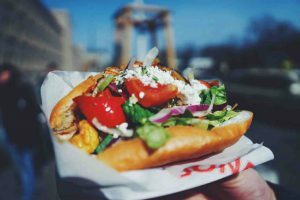 If you want to enhance your Berlin food experience and eat like a real Berliner, check out this article we wrote. *This article has been graciously sponsored by Beck’s. A sample of our favorite spots in town. Do it like a local!